The video is 4096x3072 recorded at 2.5 FPS on the 5D III. dng_unpack_image_bits has a problem with invalid reads too, but I'm not sure of the best way to fix that one. I have a 5d3 to play around with for the next couple days. Can't seem to figure out crop rec, I'm interested in being able to record UHD. Can somebody please tell me their working settings to get continuous'ish high res 24fps raw video? First look at first post of this topic, there is a good and relevant video tutorial. And read text also. It is recomended that you read lets say last 10 pages also. UHD is not continous. You will probably get something around 3520x1320 on 11...8bit lossless. That is under 3.5K in crop_rec menu. If you will set FPS override, you will experience altered shutter speeds in crop mode, but you can fine tune even that, it works. Your question is probably not being answered because this is experiments development page, but I can totally get you, I spent a few days just browsing through forum and didnt get it completely, but then after testing it for another few days... Latest developments here are even hard to follow and test, so huge respect to all of the people here, who actually move this developments forward. It takes alot of time but it is defenitely worth it. 3072x1304 2.35:1 @ 23.976 & 2520x1440 @ 23.976 Is just working fine in 700D without any corrupted frames I didn't know why I got frames corruption before. Here the new settings in the spreadsheet and crop_rec module for testing. I didn't go for 2560 instead of 2520 because the LiveView will be scrambled for only 40 pixels not a big deal, isn't it? Maybe if we could solve the distorted LiveView mystery the 2560 will be a great thing. 2520x1420 is True 16:9 in this case (in Camera 2520x1418 I don't know why but you can go up to 1440). Have you managed to test the source from reply #1824 on 700D? Mind highlighting the differences between current and previous configuration? 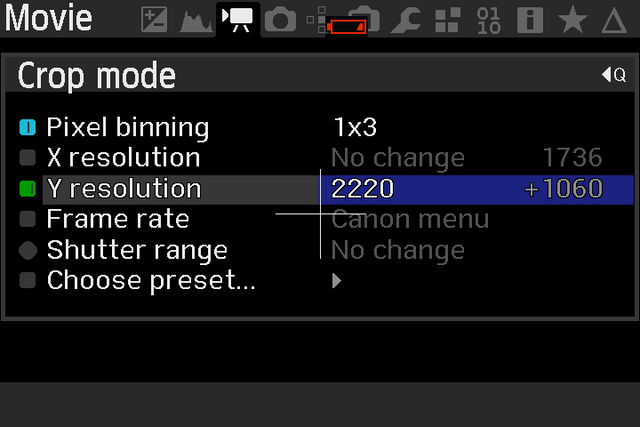 If the 700d works about the same as the 6d, I'll think you can get even more vertical resolution in 2520 mode. 6d needs the B timer(6014) to be about 4F(hexadecimal) higher then the vertical resolution in 6804. Can you try what happens if you make a small change in the 2520x1440 crop ? This would give a vertical resolution of ~1753, only problem now is, you need to line out CMOS 7 value for this vertical resolution, to get normal frames again. You can do this from within the crop_rec menu, use q button to enter crop_rec menu and change delta_head 4 timer. Change delta head 4 timer 1 increment up and check your liveview/preview, if not correct, do another increment, check one increment at the time and see if your liveview/preview is back to normal again. When liveview/preview is normal again, check the value in the menu you have for delta head 4. 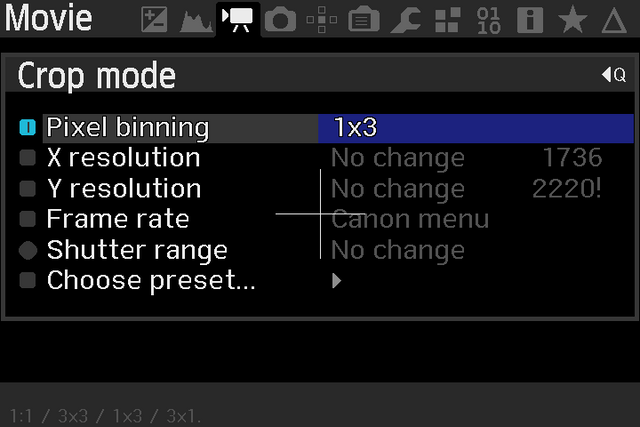 Now to fix the crop_rec preset, you can change the value for CMOS 7 by adding the value of delta head 4. Remember CMOS 7 value is hexadecimal and delta head 4 value is decimal. If this works, it means you probably also can get 3072 x 1440 resolution. Everything is working Just fine you are genius! Wow the new source code is a awesome and the way you can change the resolutions and mods is Perfect! I didn't notice any problem with all mods and there are no corrupted frames at all the only thing is you have to refresh LiveView manually as you mentioned. The centering is almost if not PERFECT I will do more tests for this one (I noticed the centering change in x10 compared to other mods but not a big deal) . Something is a bit annoying when pressing x5 mode the FPS stays 30fps I want to keep 2520 for not destroying LiveView and I want to increase vertical res I can get only 2520x1230 in 30fps and there is no way to decrease FPS to 23.976 for getting more vertical the solution is to exit x5 back to 1080p24 now the FPS is 23.976 with increased height up to 2520x1604 but the LiveView is scrambled (In this case I have to change X resolution to 2520). It should be an option to set 23.976 FPS in x5 mode. I tried also the max resolution in 3K (X res to 3072 Y res to 2000) I got 3072x1302 the same as what I got in adtg_gui using trial and error method. The only thing is missing is the higher SD write speeds and the lower bit-depths. Alex.. You have unlocked the Canon cameras like a Monster! merciless! We don't have to override each register manually anymore! The new way is by Entering the X and Y Resolution you want and crop_rec will do the calculations for each register to get that resolution and if the resolution and FPS reach the limits it will not increase anymore and you will be in the safe frames area! I can get with above way up to 2520x1604 @ 23.976 and the Max resolution in x5 16:9 is 2700x1500 @ 23.976. I forgot about the experimental crop_rec Alex made for the 700d. Have you tested max framerate in 720p mode ? I got best results in 5x zoom mode in 720p50 canon mode. In 1080p mode the 6d softbricks ad about 38 fps. Tell us, can you get 75 fps, 100? No luck with high FPS on 700D from my side, but didn't try too hard. Long answer. At least I'm starting to know where the limits come from. It's done in 3x5 readout (Not in 5x zoom mode but in full view), resolution at 96 fps is 1440 x 360 -> which after correction for the squeeze factor, results in 1440 x 600 resolution. I see the youtube compression does horrible things, better download the files for better view Probably because 360p is only available at start, now 1080p available. Mind sharing the full register configuration, or source code? If you weren't able to lower timer A, I'd expect the horizontal resolution to be full width (1824 iirc). Have to go to work now, will send source later. 1x3 Sampling (Binning/Line skipping whatever) it was only for 5D3 I tried to get it using adtg_gui about three months ago and it worked and it was perfect with no aliasing like the samples above the problem was too wide aspect ratio 1736x386 (actually 1736x1160 but you have to stretch it to get the correct aspect ratio) I didn't realize I can increase the vertical resolution so I can get more vertical I was thinking 1x3 like 3x3 nothing to do with resolution.. I thought okay let's make a try to increase vertical in 1x3 and it worked then I realized I was wrong and there is no vertical lines skipping so you can get the original height in sensor which is stretched 3478 pixels. To get 1736x736 2.35:1 the vertical should be 2220 in Y res you actually shooting 1736x2220 @ 23.976 FPS then stretch it down in post to get the right aspect which is 1736x736. Nice! :D as a1ex said no much luck on 700D. Great Job! Amazing developments. One of the biggest drawbacks to these cameras, aliasing, has been conquered! I just had a facepalm moment. At first I thought that the 1x3 was reading every pixel horizontally and skipping vertically. That's because I'm more familiar with the way image sizes are expressed. Take 1920x1080 for example, always horizontal size first by vertical size second. 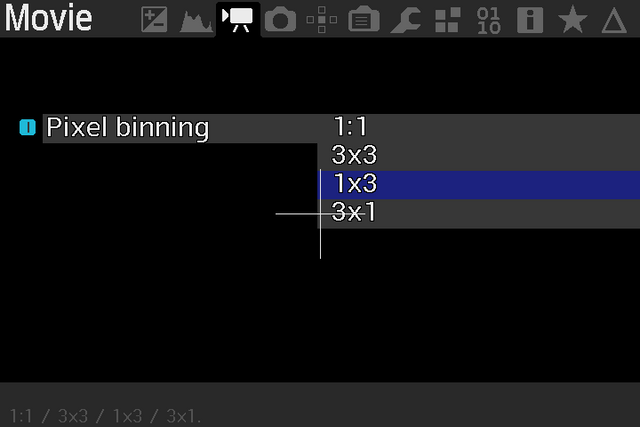 The way ML is showing binning/skipping patterns is line by column. sampling 5x3 (read 1 line, skip 4, bin 3 columns)So that means sampling 5 vertically by 3 horizontally. I haven't taken a close look at the crop_rec 1x3 pattern on the 700D yet but I'll update this post when I do. Ok--back to why 1x3 is working so well. All of the ML ported cameras are blending (binning) the pixels that are lined up horizontally but only the 5D3 bins the pixels that are lined up vertically (columns) so unless you are using a 5D3 you are probably going to experience some pretty serious aliasing, especially with the mv720 setting that samples every 5th pixel vertically. Now a head scratching moment--does the 5D3 always bin the columns even when in mv720 mode? ...I now have very strong reasons to believe that 5D3 does a 3x3 binning in 1080p, and a 5x3 binning in 720p (5 lines, 3 columns). Back to what this means for non-5D3 users is that we should be able to get the same 5D3 raw image quality by shooting 1x3 then correct the aspect ratio of your footage in a way that it smoothly blends--no pixel skipping. Very nice! I was used to Octave notation (line/column) when writing the binning notation (5x3 etc), but relating these to resolution seems more logical; too late to swap them? Now to figure out how to use the Eeko routines in LiveView and compress the footage to 3x3 (or at least 2x3) before writing it to card. Binning: I believe all cameras are either reading out every column, or binning 3 columns of the same color. Some models apparently can bin more than 3 columns. Column binning is always configured from CMOS registers (model-specific). Wow, bilal, a1ex. Epic. 700d, how about the eosm? Closely related registers? Likely identical; please give it a try (enable the is_700D flag in the experimental source from #1824 and let me know how it goes). 650D might work as well. 100D might need minor tweaks or might work out of the box, too. Need to check the CMOS registers for differences, as these are usually model-specific. Built on 2018-09-15 17:02:43 UTC by rosiefort@RosieFoComputer. I was used to Octave notation (line/column) when writing the binning notation (5x3 etc), but relating these to resolution seems more logical; too late to swap them? @dfort: enable the is_700D flag for the EOS M, or turn these conditions into is_700D || is_EOSM. @Bilal: in the emulator I've got a vertical resolution limit of 2306 pixels for 1080p24 1x3; wondering why you've got 2220 as the upper limit (this screenshot). I've got 2200 in 25p. May I ask what timer values did crop_rec pick for your preset? Or maybe you tweaked the 260 from these formulas? Built on 2018-09-11 08:15:57 UTC by Bilal4Fakhouri@WORKS. Okay, got it. These timer B limits are difficult to find because they are not hard (you don't see the image breaking as soon as you cross some limit, like it happens with timer A). Vertical resolution can usually be pushed further (i.e. closer to timer B) in low FPS modes. Not sure what's the best formula to use here. Writing down various resolutions and their outcome (stable or not) should reveal a pattern. Selecting a higher margin (i.e. using 280 or 300 instead of that 260) may be a better option for high FPS modes, but might be suboptimal for e.g. full-res LiveView. I did not try to record anything during my tests, only tried to get clean grayscale preview in mlv_rec. Did think about this solution for aliasing too, it's just a matter of setting the line skipping factor to 0 (register 800c) in non zoom mode and expand the vertical resolution. But I must say, the 1x3 files look a lot better, much more detail. Can you share some sample DNG's of these examples. Both an 1x3 file and 3x3 dng file from the same subject ? Curious how much the difference in detail is in a raw editor.